Beauceron raised more than $500,000 in its seed investment round. The round was led by East Valley Ventures and Mariner Partners and included $150,000 from the New Brunswick Innovation Foundation (NBIF). In addition to securing early investment, Beauceron has attracted 11 clients in higher education, information technology, manufacturing and government in Canada and the United States. Clients include the University of New Brunswick, the Schulich School of Business at York University, Bulletproof Solutions, Gaming Labs International and the City of Fredericton. Beauceron is also partnering with Bulletproof Solutions, Mariner, and Accreon Inc., who are helping bring the Beauceron technology to customers throughout North America. Beauceron began in the fall of 2015 when Mr. Shipley, along with UNB IT staffers Benjamin Steeves and Sean McDougall, started to explore a new approach to measuring, managing and monitoring cyber risk as a personal project. Together with co-founders Bob Corson and Ian MacMillan, they began building their innovative, web-based cyber risk technology. 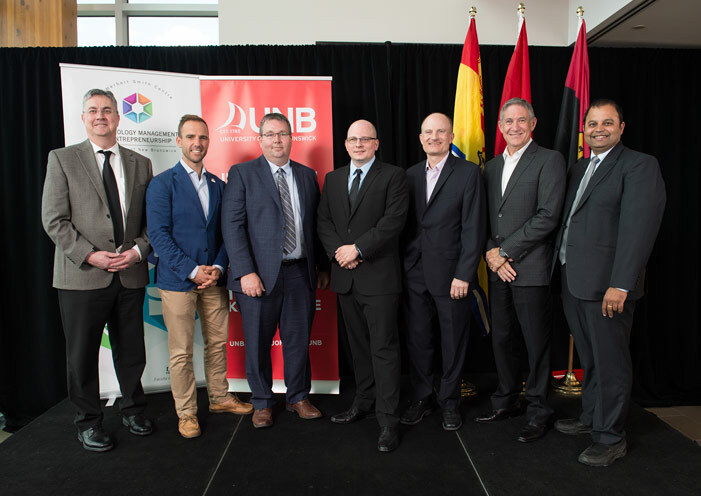 In December 2016, Beauceron was accepted into the inaugural cohort of Energia Ventures, a UNB-based, startup accelerator in the J. Herbert Smith Technology Management and Entrepreneurship Centre (TME). Mr. Shipley said the Energia Ventures program helped Beauceron prepare and execute the firm’s successful launch. In addition to the support from Energia, Beauceron benefitted significantly from UNB’s willingness to be a beta site for the development and refinement of the platform. Beauceron’s launch, along with past success stories like Q1, demonstrates why Startup Canada named UNB Canada’s most entrepreneurial university, providing support not only to innovative ideas from students and faculty, but also from its staff. Beauceron Security Inc. is a Fredericton-based cybersecurity software developer that provides a unique platform for measuring, managing and monitoring cyber risk based on people, process, culture and technology. The University of New Brunswick (UNB) is Canada's oldest English-language university. Founded in 1785, the multi-campus institution has a rich history and a dynamic focus on innovation, experiential learning and entrepreneurship. UNB has nearly 10,500 students from nearly 100 countries while several thousand more take UNB courses online and at partner institutions around the world. UNB contributes significantly to the province with an annual economic impact of $1.2 billion on the provincial economy – equivalent to 4.5 per cent of the gross domestic product of New Brunswick.